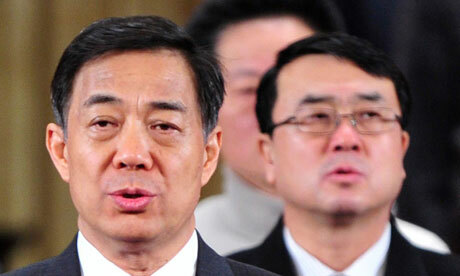 Bo Xilai was the Communist Party Secretary of Chongqing for several years. This huge metropolis is the central government’s hub for growth in southwest China. As Party Secretary, he outranked the mayor, and was the main instrument of central government control. His downfall – and that of his Police Commissioner Wang Lijun – can tell us a lot about how power can be used and abused in China. Bo had been in the news a lot. He was one of China’s princelings and used to be the Minister for Commerce in the central government before he fell out with Hu Jintau (wrong faction) and was demoted and banished to a challenging posting in Chongqing. Shortly after he arrived, he ordered a crackdown on corruption in this city which netted the police chief Wen Qiang (executed), members of the local mafia (thirteen executed and thousands jailed), and an unknown number of local government officers who were jailed if they had no powerful patron, or quietly transferred if they did. Many businessmen were incarcerated and their wealth expropriated. Bo was assisted in this undertaking by Police Chief Wang Lijun, whom he had worked with before in the north-eastern province of Liaoning. He had asked Wang to come to Chongqing to take charge of the investigations into corruption in this city. Both men belonged to ex-president Zhang Zemin’s old-guard, left-leaning faction and had been a team for years. Bo’s main goal however, was to become a member of the Standing Committee, the inner sanctum or ‘cabinet’ of the Politburo, when there was leadership changeover in late 2012. Internal lobbying and jockeying for positions was fierce. Bo was up to the challenge though, and he was expert at promoting both Chongqing and himself. For example; he introduced the so-called ‘Chongqing model’, which pushed a return to old leftist ‘red’ ideals. This phony movement was a top-down imposition on the population rather than a grass-roots movement. Cynics had claimed that both the corruption clean-up and the revolutionary rhetoric were Bo Xilai’s vehicles for self-promotion. Critics also accused him of deliberately targeting many of his predecessor’s staff in the clean-up, in an effort to consolidate his power and rid himself of factional enemies. He also got his hands on their wealth. This was the context for the bizarre events involving the Chongqing Police Chief Wang Lijun and his attempt to seek political asylum in the US Consulate in Chengdu in neighbouring Sichuan province. Bo’s enemies were circling. His aggressive leftist posturing had unsettled the more conservative powerbrokers in Beijing. They also knew that he had details of their own corrupt practices and that he would use this material as levers to achieve his goal. What frightened the conservatives even more, was disturbing information that with the support of his left-faction, he might topple the putative new leader Xi Jinping in a coup after the changeover. Serious. So his conservative enemies began leaking information about Bo’s time as leader of Liaoning province. Both Bo and Wang were implicated in a policy of harvesting organs from unwilling Falun Gong donors. In fact, Bo has international law-suits against him on this matter (Wang Lijun had actually received a scientific award for his supervision of the ‘technical’ side of harvesting). Bo’s political enemies were not interested in justice though. They just wanted to damage his chances for promotion to the Standing Committee. Then Wang told Bo that his wife Gu Kailai had been involved in the murder of a Western friend and colleague over a business matter, and that he had tried but failed to protect her. Bo was so outraged that he assaulted him. He knew that Wang’s association with this crime could damage his chances for promotion. So he demoted Wang who then threatened to expose Bo’s corruption and human rights abuses. Bo’s career was in danger, and Bo was a dangerous and powerful man. When Wang learned that his driver and some other staff had been arrested and tortured (one ‘suicided’), he feared that Bo intended to assassinate him. This is why he bolted for the US Consulate in Chengdu, taking evidence against Bo with him. He was followed by the mayor and a large posse of police vehicles and armoured cars. The Consulate was surrounded and nearby streets were blocked off. However, Wang Lijun was unable to get what he wanted; i.e., the safety of political asylum. It appeared that the US government did not want this matter to become an international incident just before Xi Jinping’s (the putative next president of china) visit to the USA. Neither did it want to be seen to be taking sides in what was regarded as an internal matter. Instead, the USA contacted the central government and arranged for Wang’s arrest by Beijing security personnel rather than the Chongqing police. A safer option for him. Beijing pulled rank, and the Chongqing cordon returned to base. Wang was flown to Beijing. Ultimately he was tried for treason among other charges. He was lucky to have been jailed rather than executed. No doubt his cooperation with Bo’s political enemies had saved his bacon. The point of all this is that morality or the law have little to do with investigations into high-ranking Party members. The law is a tool to disable your opponents. There is also an unwritten law: corruption investigations should never go near the leadership group. However, as a sign of how brutal and desperate the factional infighting had become, Zhou Yongkang – Bo’s supporter and Standing Committee member – leaked information to the New York Times on how Premier Wen Jaibao’s family was corrupt. This was a shot across the conservative faction’s bows. The point being: lay off Bo, or I will expose everyone. Zhou was responsible for the law as well as internal security and was a very powerful man indeed. He had the goods on everyone, and was game enough to break the unwritten law. However, in the end, the conservatives won. Xi Jinping is now President of China, and should serve out his ten year period of leadership without fear of a coup. Bo is rotting in jail after a show trial, and is unable to destabilise the ship of state any further. He was expelled from the Party, charged with corruption, and stripped of all his assets. But as everybody in China knows, his real crime was not corruption. It was his politics. And as is the way of these things, Zhou (now retired) is being pursued by the conservative faction. One by one, his associates are being tried and jailed for corruption. Another purge. Payback. Zhou is an ex Standing Committee member however, so it is unlikely that he will ever see the inside of a courtroom. The Party knows everything, but keeps all this information close to its chest. The public must never know how corrupt it is. Wang Lijun’s flight to safety has opened a big window into the internal machinations of the Chinese Communist Party at its highest level. This is unprecedented. Ideology is dead, and the only thing that holds this leadership group together is a shared lust for power at any price, and the desire of its members to enrich themselves in the process. In my opinion, this is the beginning of a long process which will end in the collapse of totalitarian Communist Party rule in China. Although it may take a generation or two to play out, the process has begun and the result is inevitable.